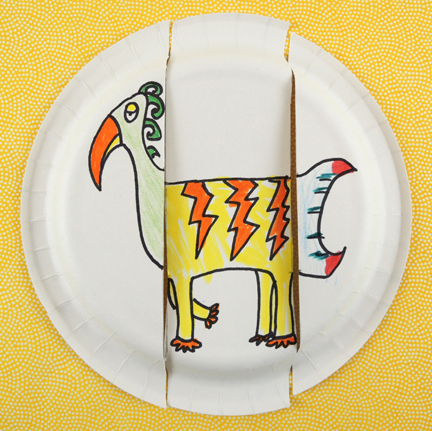 Even with practically zero prep and minimal supplies, this story time will get kids sharing and giggling at different crazy creature combinations. The silliness is endless! We recommend reading I Saw a Bullfrog by Ellen Stern (Random House, 2003). Playful from the very start, this book takes kids through the twisted linguistics and hilarious illustrations of a bullfrog (bull head and frog body), rat snake (rat head and snake body), tiger shark (tiger head and shark body), and so on. At the very end, however, the author provides the actual illustrations and interesting information about the real mammals, reptiles, plants, insects, and birds depicted in the book. 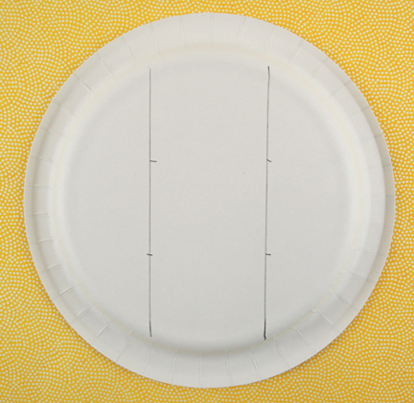 You might wonder why we used paper plates instead of index cards or pieces of paper. 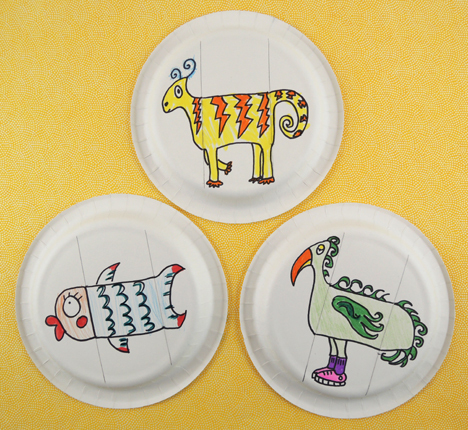 We found the elevation of the paper plates nice to draw on, and the workspace just tall and wide enough for many forms of creatures. 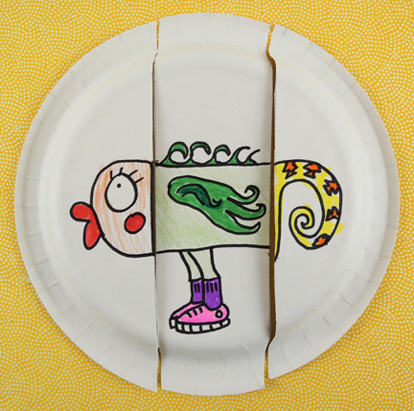 Also, the raised edges of the paper plates make it easy for little hands to pick up, manipulate, and match the pieces. Change a familiar landscape to a nocturnal world full of shadow and intrigue. 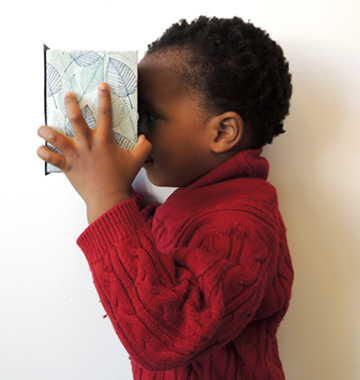 It’s our Snap Story Time version of night vision googles, ready to go in a few simple steps! We recommend reading The Night World by Mordicai Gerstein (Little, Brown, 2015). When Sylvie the cat wakes a sleeping boy, it leads to a nocturnal adventure through the house to a backyard sprinkled with stars. The animals gather, waiting for sunrise, which comes with wild, gorgeous bursts of color. In the Author’s Note, Gerstein describes waking up in the dark as a child and seeing his familiar backyard transformed into a place “full of dark shadows and strange silvery shapes.” I loved that concept, and designed this project to semi-replicate the experience. 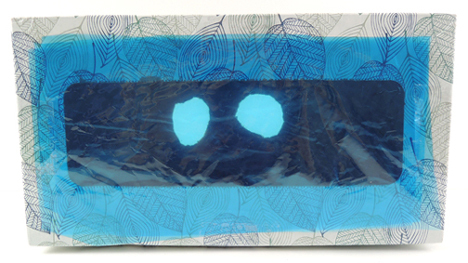 Then tape rectangles of blue cellophane over the opening of the tissue box. 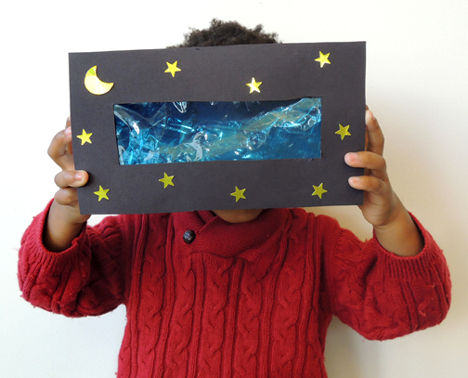 We did 3 layers of cellophane to darken things down quite a bit. 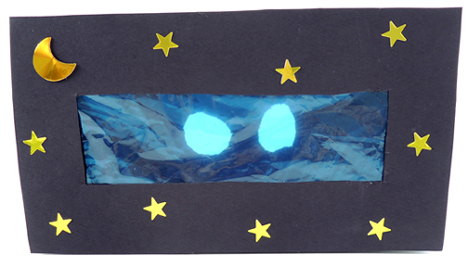 To operate, place the goggles up to your eyes and watch as your familiar space is transformed to a cool blue night world! School has started, fall is around the corner, and the leaves are starting to change. So it’s the perfect time to post a simple sound and color story time featuring fall leaves! We recommend reading Ska-tat! by Kimberly Knutson (Macmillan, 1993). 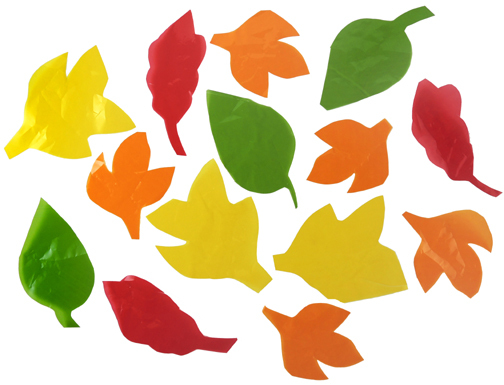 Leaves are falling off the trees with a “Sh-kah sh-kah” sound, and there is so much to do! Scoop them up with a “Krish-krash! Ka-rak!” or jump into piles with a “Sha-shoo! Ska-tat!” This highly poetic book beautifully creates sound words for various fall leaf activities. It’s a fantastic and fun read aloud. 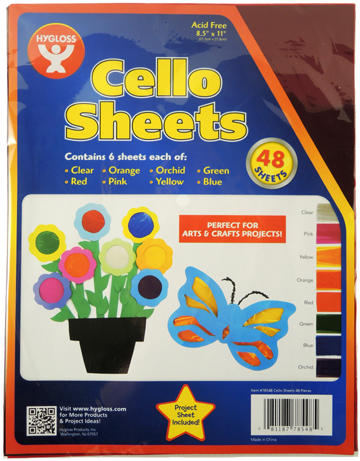 I bought these 8.5″ x 11″ cello sheets at Discount School Supply ($7 for a pack of 48). The sheets are flat, so no problem cutting out shapes and having them curl up on you. The trade off, of course, is volume. 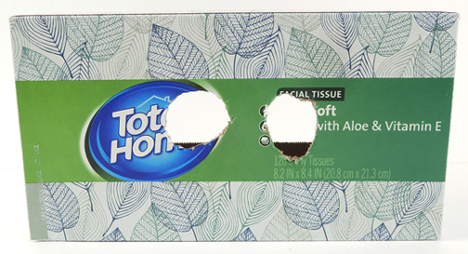 In the above pack of 48 sheets, there are only 6 of each color. However! I did spot a 104 pack on Amazon with 13 of each color for $9. If you ultimately decide go with rolls of cellophane instead of sheets, try flattening the shapes under a stack of books overnight to see if that helps uncurl them. 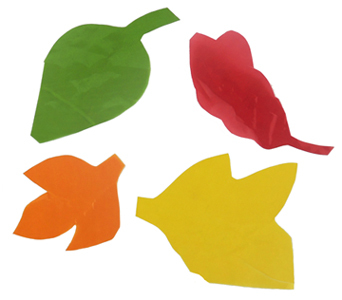 For the story time project, cut various leaf shapes out of cellophane. Then have the kids crumble and crunch them, crinkle them madly, stomp on them, toss them in air, slide with them under their shoes, put them over their eyes to see the world in red, yellow, orange, and green…in short, PLAY. When you’re done, tape the leaves to a window to brighten things up!